Fayetteville, Arkansas is number 4 for Forbes "BEST PLACE for Business and Careers"
Fayetteville has also made other lists including Kiplingers List for Best City in 2008. Fayetteville ranked #7 on this list. Check out the video! 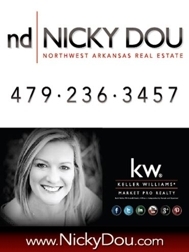 Forbes Best Place for Business and Careers, 2009 - Fayetteville, AR..
Top tips for getting your home ready to Sell!